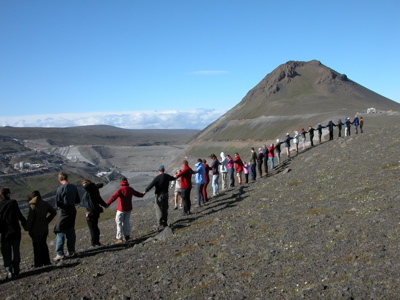 We are a network of people of different nationalities, who do not intend to stand by passively and watch the Icelandic government in league with foreign corporations slowly kill the natural beauty of Iceland. Icelandic environmentalists desperately need outside help to drive away the corporate threat to their island. In these pages you will find out more about Saving Iceland and find resources for action. The website was first launched in September 2004 under the name Killing Iceland but was soon changed to Saving Iceland. Thanks for photographs to Jess Hurd, Jóhann Ísberg, Robert Wallis, Jóhann Óli Hilmarsson, RAX, Haukur Snorrason, Rut Hallgrímsdóttir, Anna Fjóla Gísladóttir, Ellert Grétarsson, Siggi Geirs, Marina Imperi, Craig Thomas, Tony Prower, Ólafur Páll Sigurdsson and others for the pictures.